Go back to Part 4 of Extreme Cold Adaptation in Humans. All right , let’s finally wind this down with an obligatory reminder from Tiina Makinen; “several individual factors effect the rates at which people respond to the same stimuli . The time course of adaptation is dependent on the threshold of the stimulus, a latency period, the physiologically and possible genetically determined maximum of an effector organ, the speed of tissue/organ/systemic adaptation”., which of course means everyone is different. There’s a nice chart of all of this, (because I think you know by now that I like charts). 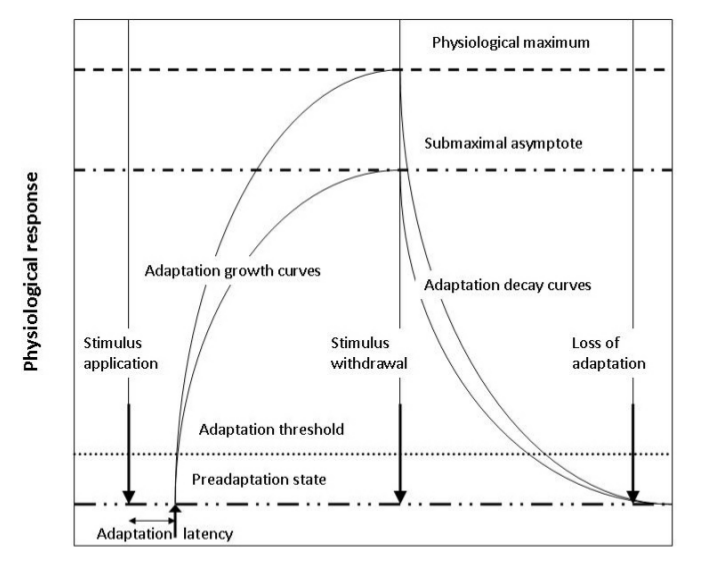 Though without a time scale axis the chart implies that pre-adaptation and adaptation decay take the same time. There’s some brief mention of health effects of cold adaptation, but that’s a different subject than what we’re pursuing here, too many non-similar studies without controls and for another time anyway. Also, and you can judge for yourselves on this, the studies seem to imply a two stage-process, pre-adaptation and adaptation. Which is fine for a study, but we know it’s not like that, as the chart shows. So the hypothesis is: Cold swimming ability is an iterative incremental positive feedback process (limited). (In a negative feedback process, a change one way directs a change in the opposite direction, (like a thermostat). It’s a regulatory process that stabilises. In positive feedback a change generates further change in the same direction, usually leading to destabilisation or enforcement). Simply, you improve habituation so you improve acclimatisation, which prompts you to return and your habituation improves further, making it easier again to become immersed, and so on. Or maybe one could just simply say, small improvements happen fairly quickly, these accumulate and allow you to improve more, so long as you keep exposing yourself to cold. Disclaimer. I never thought this would be so long! But it didn’t know it would be so much fun to write either.